Medium to full in body, and over-the-top in dark, delicious taste, the E.P. 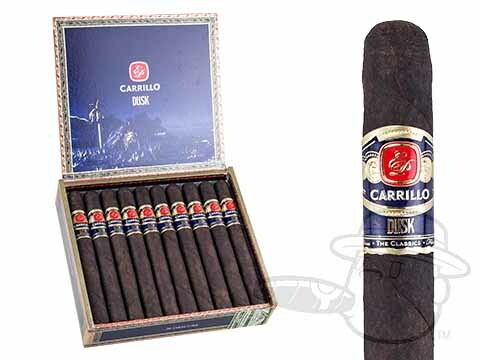 Carrillo Dusk is here to fulfill your flavor fantasies. Equipped with an undisclosed U.S. Wrapper leaf over an Ecuadorian binder and Nicaraguan filler blend, the Dusk will dazzle any palate with its enticing ensemble of sweet cedar, roasted nut, dark coffee, mocha, raisin, and black pepper tasting notes. If complex maduros are your bag, you’ll want to fill up on Dusk, pronto. It just so happens that we’ve got them at dramatic discounts from their suggested pricing.